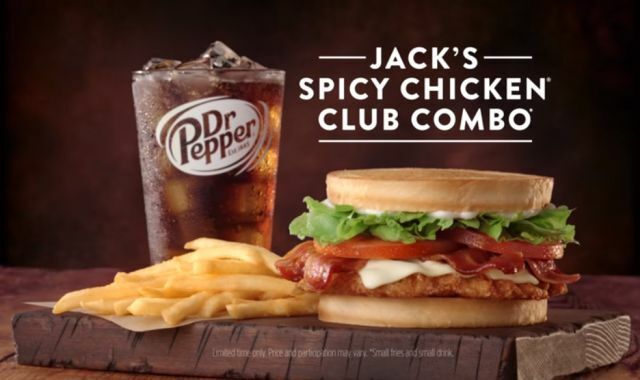 Jack in the Box offers up the new $4.99 Spicy Chicken Club Combo for a limited time at participating locations. The key feature of the $4.99 value meal is the Spicy Chicken Club which consists of a spicy crispy-fried chicken breast filet, hickory-smoked bacon, Swiss-style cheese, lettuce, tomato, and mayo on toasted sourdough. The $4.99 combo also includes a small order for fries and a fountain drink. The chain has offered the same combo as well as a $4.99 combo with a Chipotle-variant of the sandwich several times in recent years.